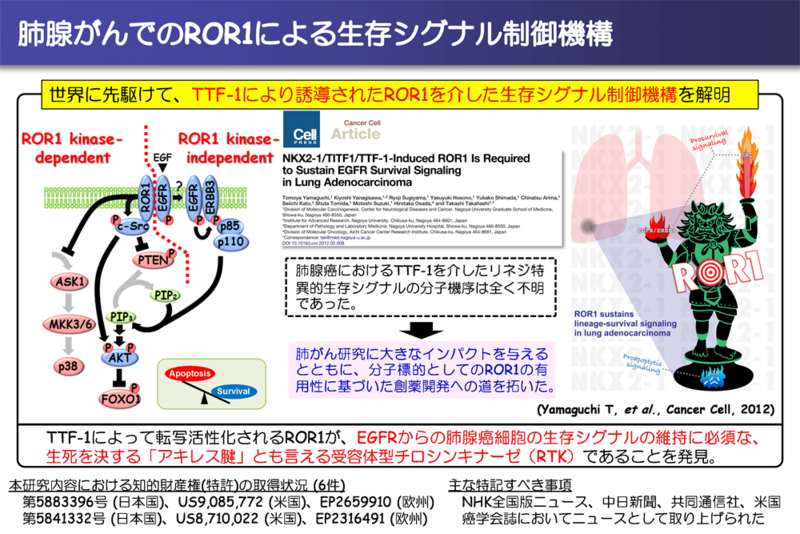 We previously identified receptor tyrosine kinase-like orphan receptor 1 (ROR1) as a target for transcriptional activation via the lineage-survival oncogene TTF-1 in lung adenocarcinoma (Cancer Cell, 2012). 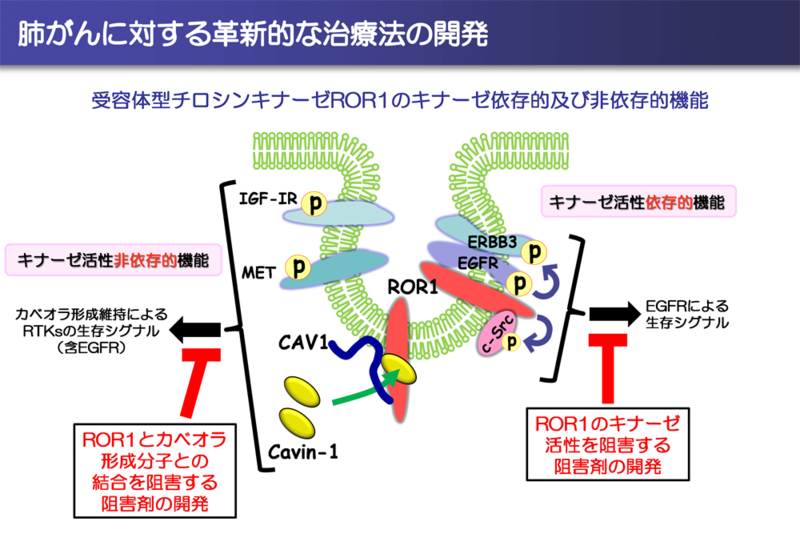 ROR1 is necessary to sustain the EGFR survival signaling in both kinase-dependent and -independent manners. 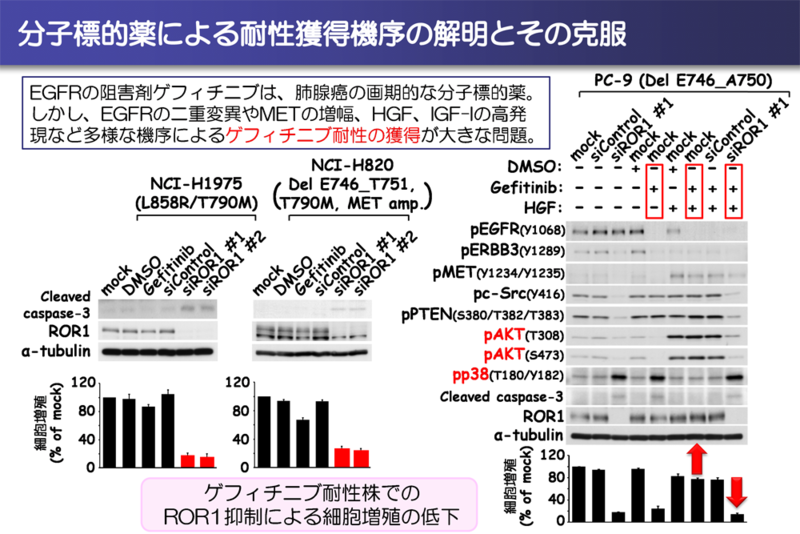 ROR1 also sustains a favorable balance between prosurvival PI3K-AKT and proapoptotic ASK1-p38 signaling pathway in lung adenocarcinoma cells (Cancer Sci, 2016). 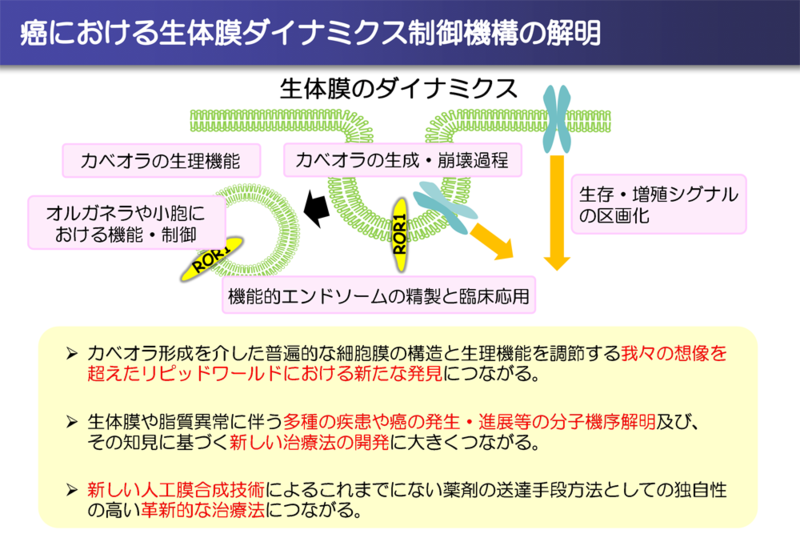 We also identified MYBPH as a transcriptional target of TTF-1 and its ROCK-inhibiting and consequently invasion and metastasis-inhibiting roles (EMBO J, 2012). We therefore proposed that TTF-1 is an enigmatic oncogene that functions as a double-edged sword for cancer cell survival and progression (Cancer Cell, 2013). 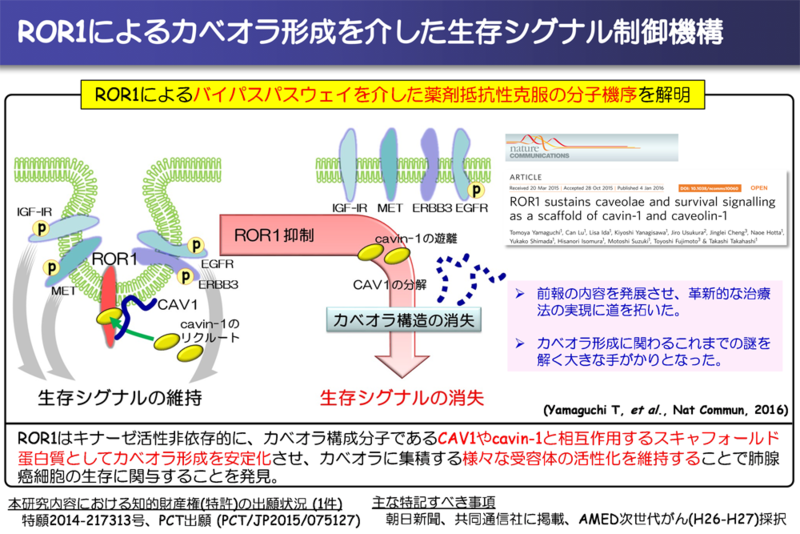 Recently, we found that ROR1 facilitates the interaction of CAVIN1 and CAV1 at the plasma membrane in a kinase activity-independent manner, which in turn sustains caveolae formation and prosurvival signaling towards AKT through multiple RTKs such as EGFR, MET and IGF-IR, via its scaffold function for CAVIN1 and CAV1 in lung adenocarcinoma (Nat Commun, 2016). 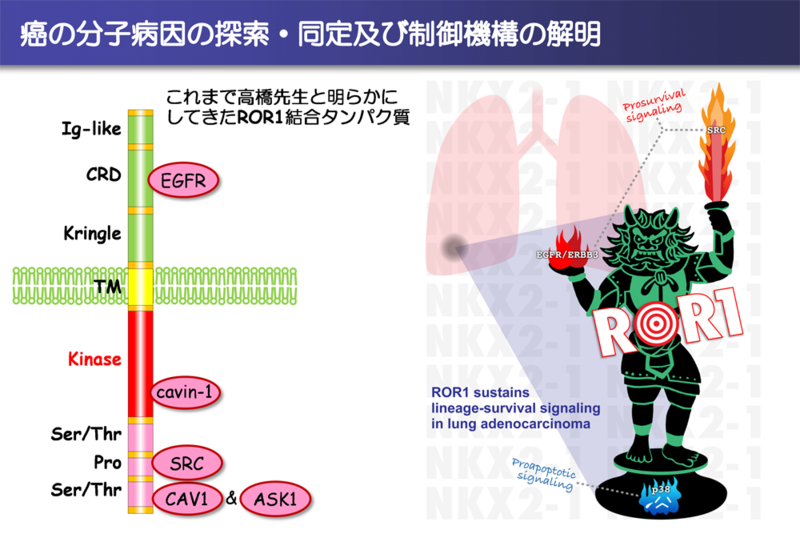 These results suggest that the scaffold function of ROR1 is an attractive target for overcoming EGFR-TKI (Gefitinib) resistance due to bypass signaling in lung cancer. 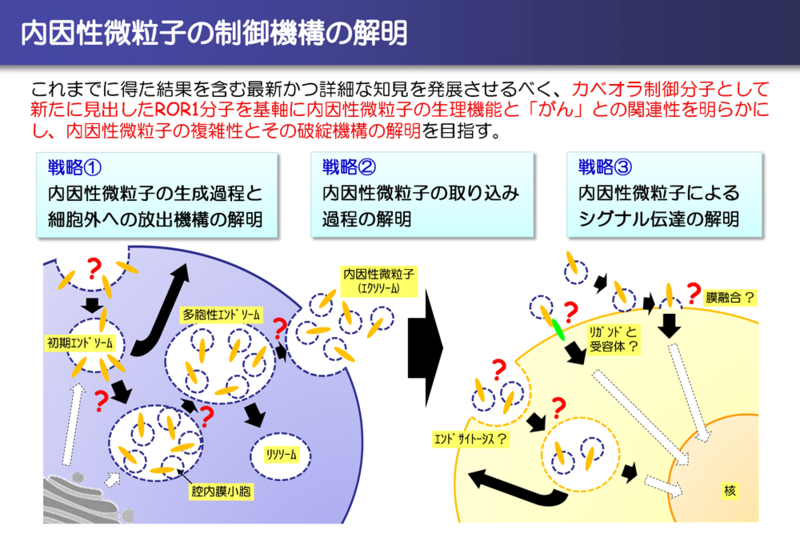 We also found that ROR1 as a caveolae-regulation molecule, is involved in cell membrane organization and dynamics.The goal of our laboratory is to understand the molecular pathogenesis of human solid tumor, hard-to-cure cancers, especially lung cancer, and then to translate our findings in order to develop novel strategies for better diagnosis, treatment and prevention. ⓒ2017　Department of Cancer Biology All right reserved.